Frederick, Maryland U.S.A. – Christopher Crowley, president of The Crowley Company, announces the formal entry of the MACHCAM 71MP Machine Vision Camera to the international market. Meeting multiple preservation imaging guidelines in the U.S. and internationally, the MACHCAM is available in two models, monochrome (MACHCAM 71M) and color (MACHCAM 71C). Using a CMOSIS sensor as its base, Crowley engineers have developed a small camera with a big impact – the case measures only 83 x 83 x 63.5 mm – and can be easily implemented into machine vision applications and as an inspection camera. The camera package includes: camera; software development kit; installation software; and manual and source code files. Previewed at the AIA Vision show this past May, the MACHCAM 71 has attracted the interest of many potential resellers. Signed to date are Korean distributor, OnVision, and North American distributor, 1stVision, with several others in the application process. The MACHCAM 71 can be sold for single use application or as an Original Equipment Manufacturer (OEM) product. Early reviews of the high-resolution camera are positive. “We are impressed with the initial cycle time (capture to transfer rate)…and are confident that the system has real potential,” states a Japanese OEM and reseller that has field-tested the MACHCAM 71. The MACHCAM 71 cameras can be seen in Booth 1D88 at the upcoming VISION Fair in Stuttgart, Germany November 8-10. Additionally, they are available for on-site testing with some restrictions. For details, contact Rich Jackson, rich@thecrowelycompany.com or call (240) 215-0224. The Crowley Company is a world-leader in digital and analog imaging technologies and provides an extensive number of digital document and film conversion services to the academic, publishing, commercial, government and archive sectors. The company manufactures, distributes and services high-speed microfilm, microfiche, aperture card, book and document scanners, microfilm duplicators, film processors and micrographics equipment. Manufactured brands include Mekel Technology, Wicks and Wilson, HF Processors and Extek Microsystems. 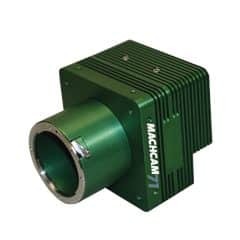 The MACHCAM 71 is available for manufacturers, distributors and direct to end-users. For key features and sensor and camera specifications, download the MACHCAM 71 brochure.